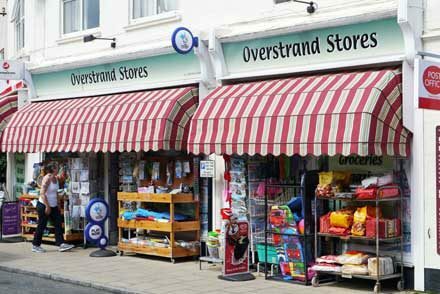 If you are a lover of the traditional English seaside holiday but find crowds and noisy amusement arcades unappealing, then Overstrand is the North Norfolk resort for you. The village is small, but unlike many in Norfolk, there is still a thriving general stores/post office for supplies and services (fee-free cash machine) Just past the shop in the main street is the White Horse public house that after a major refurbishment provides excellent food in comfortable and stylish surroundings. Rooms are also available at the White Horse. Accommodation in Overstrand is provided by the four star Sea Marge Hotel, the Ivy Farm Holiday Park and various B&B establishments. A short distance outside the village is Northrepps Cottage Country Hotel that is rated three stars. At the end of Cliff Road is the popular Cliff Top Cafe where full English breakfasts are enjoyed by hundreds of visitors every season. The cafe is an arm of Cliff Top Holidays that has a holiday cottage in the village and others in the nearby village of Roughton. A short distance from the cafe is a shop where you can purchase delicious freshly-caught crabs and lobsters. There is a large pay and display car park on the cliff top with well-maintained public toilets. 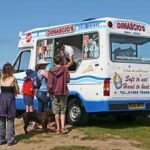 An ice cream van is in almost permanent residence at the car park throughout the summer season. Access to the sandy beach (no lifeguard) is via very steep slopes so wheelchair users and senior citizens can have difficulty getting down to the promenade. Overstrand has an excellent bathing beach and other than at high tide there is plenty of pristine sand for castle building and ball games. The larger coastal resort of Cromer, where you will find more entertainment available, is just a short drive to the west. For a quieter holiday in lovely surroundings, Overstrand on the North Norfolk coast is hard to beat. The Methodist Church was built in 1898. The unusual design was by Edwin Lutyens. Overstrand Hall, also designed by Lutyens, was constructed between 1899 and 1901. It was built for a wealthy banker called Charles Mills (Lord Hillingdon). The hall is a large, impressive building that is unfortunately not accessible to the public. The Pleasaunce is yet another Lutyens design. Built 1897-9 this large house stands in extensive grounds opposite the cliff top car park. Some of the buildings are somewhat eccentric and remind me of Portmeirion in Wales.